One of my primary classes just finished up a math pre-assessment. One of the questions on this assessment asked students to explain their mathematical reasoning. Specifically, they were given a prompt, a student example, and then asked to explain in their own words what happened. Students had a lot of questions about this problem. Since it was a pre-assessment, I basically kept quiet and asked them to persevere. Some did, others didn’t. A few students dropped their faces when they saw their pre-assessment results. Many, and I mean over half of the kids didn’t meet the expectations on the written response. Instead of putting together sentences, the majority of students created number models and that was that. Some students even wrote that the character was wrong and didn’t explain anything further. I was a bit disappointed, but no worries though – this is a pre-assessment. The actual assessment won’t happen for another couple weeks. I noticed that I needed to look more closely at how to address the math writing issue. I also needed to clarify the expectations for written responses. This was new territory for kids. Most students are able to tell me (with prodding) their thinking and how it relates to the problem solving process. It’s a different story when it comes to writing it down. In the next few week I want to ensure that students are explaining their mathematical thinking clearly and in a way that answers the question. So this Wednesday students were asked to start looking for specific details in their writing. We began by having the entire class analyze one math response from another “student” from a couple years ago (ok … maybe I created this). Students went into teams and analyzed the exemplar and looked for key components in the response. Students looked for an answer statement, math vocabulary and important numbers. They then coded the response with circles, rectangles and underlining. The student teams explained to the class what they thought qualified as an answer statement. This was a great discussion as students came to a consensus to what qualifies as a statement that answers the question. Students also discussed the numbers that were important and the math vocabulary that was used. Later in the day students answered a similar prompt and then switched papers with a peer. The other student coded the paper and then the pairs discussed what they wrote and why. The class will be meeting next week to review more examples. Afterwards we plan on responding to a different math prompt and code our own writing. I’m looking forward to seeing how this emphasis on mathematical writing transfers throughout the year. My fourth grade students took their first unit assessment of the year last Wednesday. This is the first class to take an assessment this school year. The unit took around four weeks and explored topics such as area, volume, number sentences, and a few different pre-algebra skills. This year I’ve been approaching student reflection and unit assessments differently. Students were given their study guide during the first couple days of the first unit. The study guide included questions that covered topics that would be taught throughout the unit. At first students were confused about how to complete items that we haven’t covered yet. Eventually students became more comfortable with the new study guide procedure as we explored topics and they completed the study guide as the unit progressed. There were a couple of students that lost their study guides, but they were able to print it off from my school website. I reviewed the study guide with the class the day before the test. It took around 10-15 minutes to review, instead of around 40-50, which has been the norm in the past. After students finished the study guide the class reviewed the skills that were going to be assessed. Students informally rated where they were at in relation to the skill. I decided to move in this direction as I’m finding that reflection on achievement or perceived achievement doesn’t always have to happen after the assessment. Students took the test and I passed back the results the next day. Like in past years, I have my students fill out a test reflection and goal setting page. This page is placed in their math journals and I review it with each student. I decided to use Pam’s idea on lagging homework/coding and add this to my student reflections. Last year my students used a reflection sheet that indicated problems that were correct or incorrect and they developed goals based on what they perceived as strengths and improvement areas. This year I’m attempting to go deeper and have students look at not only correct/incorrect, but also at error analysis. So I handed back the tests and displayed an image on the whiteboard. I told the students that we’d be using coding in math today. I reviewed the different symbols and what they represented with a test that was already graded. Each question would be given a code of correct, label / calculation error, misconception, or math explanation. I gave multiples examples of what these might look like on an assessment. I spent the bulk of my time introducing this tool to the misconception symbol (or as some students say the “X-Men” symbol) to the students. After a decent amount of time discussing what that looks like, students had a good feel for why they might use the math explanation symbol. I then passed out the sheet to the students. Students went through their individual test and coded each question based on the key. At first many students wanted to use the label/ calculation error code for wrong answers, but then they stopped and really looked at why their answer didn’t meet the expectation. In some cases, yes, it was a label issue. Other times it was an insufficient math explanation. Most of the students were actually looking at their test through different lens. Some were still fixated on the grade and points, but I could see a shift in perception for others. That’s an #eduwin in my book. After students filled out the top portion of the reflection sheet they moved to the rest of the sheet. Students filled out the remaining part of the reflection sheet. They then brought up their test and math journal to review the entry. At this time I discussed the students’ reflection and perception of their math journey and I made a few suggestions in preparation for the next unit. At some point I’d like create an “If This Than That” type of process for students as they code their results. For example, If a student is finding that their math explanations need improvement then they can ________________ . This type of growth focus might also help students see themselves as more owners of their learning. I’m looking forward to using this same process with my third and fifth grade classes next week. Improving how students reflect on their math progress has been one of my goals during the past few years. It’s a topic that I’ve been trying to incorporate more in the classroom. That reflection piece in my classroom has changed quite a bit since starting this journey. Last year students would take an assessment, review their scores and then fill out a reflection sheet. Students filled out the reflection sheet the best that they could. The students and I would review the test and reflection sheet to determine the next steps. Some reflections were spectacular and had a lot of insight, others didn’t. Most of the time the next steps included items like studying more before the test, reviewing a certain concept in more detail, practicing specific skills, or dedicating more time to the subject. I’ll admit that too many of the nexts steps were vague and wouldn’t match the SMART criteria. I was glad students were creating goals and following through. Refinement was needed, but I appreciated that students were lifting up more responsibility for creating their math identities. The students did a fine job following up with the next steps, although this was inconsistently implemented. I’d check-in on goals during the next reflection time. While reading Make it Stick (I’m on the second renewal from the library), I found something that I’d like to keep in mind for the new year. In chapter five the authors discuss the Dunning-Kruger effect. Research has shown that people (students) sometimes overestimate their own competence. They “… fail to sense a mismatch between their performance and what is desirable, [and] see no need to improve.” As I continued reading I found that lower-performing students were the most “out of touch” in gauging how well they were doing compared to the standard. After reading this I started to think about how students accurately reflect on their math progress. Students are often asked to compare their work to the criteria for success. The points/letter on the top of graded work is generally perceived in black and white. Students either view themselves as doing great or poor. There’s nothing in the middle. I rarely have a student that says they had an average test. This becomes even more evident when students complete the reflection and goal setting sheets. I’ve had a number of instances where students can’t come up with a goal for themselves. Through probing questions I’m generally able to help students create a goal that is worthwhile, but this doesn’t always happen. I believe math confidence and adopted math identities play a role here. The perception is stuck on the score and it’s challenging to move beyond that number. Maybe it’s because students aren’t as familiar in gauging how they’re performing compared to the standard? I’ve used different methods to encourage students to look at skills compared to points and this has helped, albeit the success using the table has been inconsistent. The authors of book discussed an experiment where poor performers improved their judgement over time. These students received training specifically on the test concepts before the assessment. That time spent improved their self-reflections and they were more in-line with reality. Basically, the students are better able to show sound judgement during self-reflection if they understand the concepts. Accurate self-reflection becomes an uphill battle if they don’t. Moving forward I’d like to spend more time discussing error-analysis and misconceptions with the class. When students are aware of how these specifically exist then they’re better able to analyze their performance. Pre-loading that meta-cognition piece is something I want students to keep in mind during the self-reflection process. I think it will deter students from making statements like “I don’t know what goal to make” or “I need to work on everything.” These types of statements are disheartening. I think having exemplars might help instead of just diving in and asking students to reflect. Having a clearer direction and possibly having a reflection time that occurs more frequently could also help. Math isn’t always perceived as a subject where students are asked to create some type of narrative and connect to the text/content. I find that students rise to the challenge when I give them an opportunities to do so. I believe that giving students opportunities to analyze, reflect, and set goals for themselves will empower them to create more accurate math identities. 1.) Students complete an assignment in collaborative groups or independently. 2.) 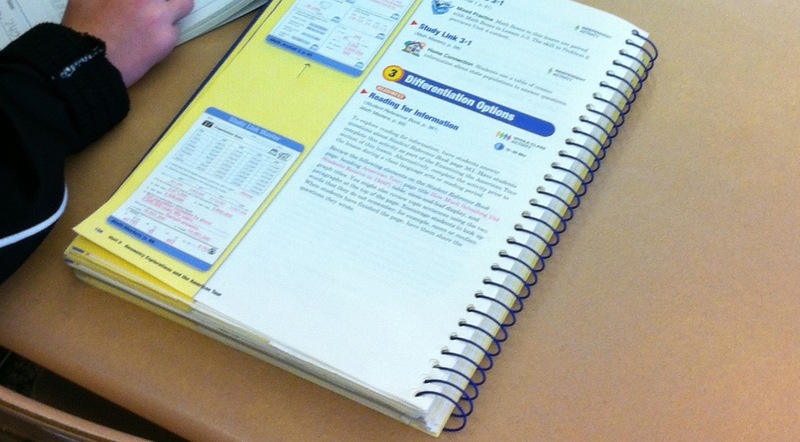 Students finish the assignment and self-correct using the Teacher’s Manual. This can also be applied to digital progress monitoring tools. 3.) Students independently use markers to indicate wrong/right answers. If needed, students will write in correct answers. 4.) Students utilize their math journals to reflect on the assignment and their feelings about the topic and achievement. It might seem simple, but I’ve had terrific results from using this strategy. Overall, I feel as though the students benefit from practices like this. The self-correcting / journal process took modeling and practice at first, but the benefits are starting to become apparent.